WRITING ADVICE - 10,000 words a day! Bron says: Born in Gunnison Utah, November 5th 1993, I started writing young. My first book in third grade, called “Grave Diggers” was only about seven pages long. For me it was a good start. Then I had a dream I couldn’t forget, and began writing at age eleven. After three years of writing, I completed “Bone Warriors” before I got to eighth grade. It took three years total for my dream to come true, when on Friday, the thirteenth of February in 2009, I got a letter from Cedar Fort publishing company that said they wanted to publish my book. Published at 15 years old! CRAVING POWER AND LUSTING FOR HUMAN SOULS, the wicked Necromancer sweeps the land, leaving behind nothing but death and devastation. RETURNING HOME, fifteen-year-old Derrik and his friend Tweaks find their homes burning and families missing. They immediately embark on a rescue quest for redemption and retaliation. Such evil cannot be allowed to roam. SINISTER GIANTS, colossal green jungle cats, and undead monsters confront them as Derrik and Tweaks encounter inconceivable threats in the forbidden woods, as well as gain unlikely allies. THE BOYS SOON REALIZE that their only hope to save their families comes from the very creature they cannot trust. But they’re running out of time. How can they put an end to the Necromancer’s terrifying reign? "Bone Warriors" is a great read. The imagery will make you feel like you're really there, and the adventure will make you rip through the pages. I loved it. James Dashner. At first glance in my cursory sweep of the LDStorymakers Conference bookstore, this title caught my eye. Then I saw the sign that said it was written by a 15 year old, while my interest peaked, all my cynical hackles did, too. I liked Christopher Paolini's Eragon, I really did - but it was entirely obvious that it was written by a teenager: gimmicks in place of emotion, long stretches of relying on travel for action, and a certain amount of predictability. Bone Warriors is SO MUCH BETTER! Bron Bahlmann is a fabulous writer! I kept expecting to find things that showed his age through his writing, and there were a couple of times I thought I found it - only to be proven wrong. Derrick and Tweaks are best friends, and when their families are kidnapped by the evil Necromancer, they go to rescue them and save the day. But its not that easy for a couple of kids on a quest. Along the way, they end up with an enemy officer as a prisoner, a giant cow that saves their lives, and menagerie of unique creatures to face and outwit, each more menacing than the last. Bone Warriors is a fantastic adventure - with two main characters that are real, believable, loveable boys. There are so many twists and turns, mixed with so many unique characters, there is no predictability - right to the very end, you aren't sure what's going to happen. The beginning is fabulous, the middle is tight, and the ending is somewhere between "happily ever after" and "cliffhanger", but I'm not sure which one is closer. You will want a hankie toward the end, but I'm not telling you why, just trust me. It's so good, that the only tiny speck I can find to critique about it is the use of the word "lycan". Lycan is one of those words like "orc" - it was created by one story(Underworld, Orc is from Tolkien), and is quickly making its way into common usage. That's it. That's my one nitpick. Believe me, I looked for more, but that was all I found. I completely enjoyed the book. I wholeheartedly recommend it to anyone who likes an adventure, and I will be keeping my eye out for more by this fabulous new author! Well done, Mr. Bahlmann! Well done, indeed! Bone Warriors - Bron Bahlmann - ISBN:978-1-59955-322-1-Available on Amazon. First of all ... Bron Bahlmann. That's a name made for a book cover if ever I heard one. And Bron was definitely made to be a writer. Bron started writing when he was in third grade and now has his first published book before the age of sixteen. How cool is that? I think my boys would especially love Bone Warriors. It has all the stuff that makes a young boys' hearts go all atwitter. There's an evil necromancer who forces the souls of those who died hopeless and without fear, power the crude creations in his army of bone warriors. There are two teenage boys, who's parents have been captured by the necromancer's minions, that are determined to save them and all the people of their village at all costs. There are unlikely allies, snake-men, giants, and myriad other amazing creatures. Bron's story is unique and well-done. It comes to the edge of really scary without being too much (in my opinion.) I would recommend Bone Warriors to boys between the ages of 11 and 15. When my good friend Shirley Bahlmann told me that her son was having a book published, I thought, "Hey, that's pretty cool." I knew he was fifteen and so of course, that makes it even cooler. I got my hands on an advance readers copy and discovered what was coolest of all - this kid can really write. "Bone Warriors" is a high fantasy adventure novel about two teenage boys, Derrik and Tweaks, who find themselves the only survivors of a vicious attack against their village. Their families have been taken by the Necromancer, who uses fear and death to fuel his evil plans. Derrik can't stand the thought of just letting his family suffer that fate, and so he sets off to save them, not having any idea where to go, how to get there, or what he'll do once there. He just knows that he has to try. Ever loyal, Tweaks goes along with him. The journey is perilous and they make some friends in unlikely places along the way. The battle at the end is satisfying as we see Derrik triumph over his enemies, and we see Tweaks as never before, fulfilling his own destiny as well. This story is highly imaginative, I didn't feel like I was reading a rehash of all the other fantasy novels on the market, and many of the phrases used were truly unique. I have to say, I was impressed. Bron Bahlmann isn't just a good writer for being fifteen; he's a good writer, period. (This book was published in 2009 by Sweetwater Books.) CLICK HERE TO ORDER! A shout out for Bron Bahlmann (gotta love that name), the son of my mentor-friend and author Shirley Bahlmann. His debut fantasy novel Bone Warriors recently hit bookstore shelves. Bron is only fifteen, folks! If this gives you visions of Chris Paolini, Weston at Wendword says Bron's work is better. James Dashner has this to say. Click here for another review from Ali at Girl in a Whirl. Tristi of Tristi's Takes also reviews Bone Warriors here. From the time he wrote "Grave Digger" in third grade, Bron Bahlmann's mom pestered him to write more. At fifteen, he finally finished the 80,000 word "Bone Warriors" which kept her busy editing until it was published in May of 2009. Did I say he was fifteen? When I was fifteen, I had lots of first chapters of novels crammed into the top drawer of my study desk, but the idea or skill of of actually writing a novel from start to finish wasn't remotely in my radar. What I thought I really wanted to be was a rich corporate lawyer who would later own a French villa then discover my parents switched me at birth and I was actually a princess. Fifteen is a memorable age. The female protagonist of my historical novel Girl From Gurian is fifteen. And so is New York Times #1 bestselling author Aprilynne Pike's main character Laurel. My fifteenth summer, I graduated from high school (we didn't have 11th and 12th grade in my Philippine high school) and went with some girls to my best friend's province in northern Philippines. My memories of that trip to this small, coastal fishing town would later inspire my paranormal novel Ghost Moon Night. I had the chance recently to read Bone Warriors, a fantasy debut by Bron Bahlmann an author and friend I met for the first time several years ago. I have to admit that when I agreed to read Bone Warriors, I did it for two reasons. One was that his mother, Shirley Bahlmann, is a good friend and wonderful author. The second reason was that I wanted to see what a fifteen-year-old could pull off. Let me clarify, this is not an author who started writing the story when he was fifteen, this is an author who is fifteen, right now, with his first published book in hand. He started writing the story when he was eleven. Do you remember what your writing was like when you were eleven? Was it even remotely publishable? Mine was not. So I went into the story with both curiosity and trepidation. What I found was writing like this: Two huge figures lumbered out from a copse of dark trees. Each walked into the meadow on two thin legs beneath bodies that were twice as tall as a man and three times as broad. The bone men appeared to be scarlet lacework gone horribly wrong, with wide spaces between woven sections. Wobbling skulls sat on top of the bone skeletons and turned with quick jerks to find bodies to stack in their giant arms like sodden firewood. Only when the sun buried itself beneath the horizon did the monstrous bodies gleam sickly white in the moonlight. The bone golems’ jerky movements came from a random attachment of bones. Never stopping, they used their strangely fitted joints to silently carry out the grisly task until not a single body was left in the trampled meadow. Then the golems deserted the bloody battlefield, disappearing beneath the dark trees with their grisly burdens. Cool stuff, huh? I finished Bone Warriors in a day, and really enjoyed it. It’s an exciting read that fantasy lovers young and old will enjoy. It is creepy enough to raise shivers and exciting enough to keep you reading late into the night. I completely enjoyed the characters and have passed it on to my sons to read. It’s not perfect. There are mistakes. But they are very small things like word usage or things that an editor should catch—many long paragraphs that should be broken, starting too many paragraphs in a row with the name of the protagonist (Derik did this, Derik did that), using the same word too close together, etc. But the story itself is outstanding enough that you quickly stop noticing any errors. Great characters, lots of action, plenty of intrigue. The ultimate compliment an author can receive is that the reader forgets who the author is and gets lost in the story. This was absolutely the case here. Bron writes a great tale, that I thoroughly enjoyed reading and I suspect there are many more to come from him. So I asked him if we could do a little Q&A. Here are his answers. 1) How old are you really? (May 2009) You know you can’t be fifteen and publishing your first book, because that’s just not fair. So fess up. Okay, you all caught on, so I'll confess, I'm actually 15 1/2 years old. Sorry for misleading you. 2) Give us the background on how this book came to be. I've always loved fantasy because it lets me make the story any way I want and lets me share my dreams with others. 4) Exact moment you found out your book had been accepted. How? Reaction? Celebration? It was honestly one of the happiest moments in my life. My grandma and two aunts and several cousins brought over pizza and a cake that read, "Congratulations!" and we had a surprise party. I felt excited and relieved. (When the books came out, I gave them each one for free. I mean, it was worth it for pizza and cake!) I also felt a new urge and power to finish the rest of my books. 5) How have your friends at school reacted to you being a published author? There have been a lot of different reactions. Most people start with a disbelieving reaction. "Really?" and "You're kidding!" are among the most popular. After they realize it's true, they move on to a type of greed mixed with envy and excitement. It's then that they ask how much money I make. They are lowered back down to disbelief when I tell them I only make about 45 cents per book. My best friends are very supportive, though. 6) Do you find beautiful women, other than your mom, following you around asking for an autograph or phone number? Next is to work as hard as I can plus a little more to finish my next book and still keep my grades up! Thanks, Bron! Can't wait to read the next one. Historical fiction authors build their stories upon the solid framework of history. Fantasy authors, on the other hand, envision new worlds with strange rules, creatures, conflicts and languages of their own manufacture; and then they invite the readers to enter. It is a fragile world, fully dependent upon the author’s ability to sustain and maintain his creation throughout the novel. But young author, Bron Bahlmann has few worries on that point. Bone Warriors, his first novel, is solid, suspenseful, and intriguing. Chapter one opens with a blood-lusting necromancer who incites war in order to claim its victims' souls. Thereafter, we follow the adventures of two boys from the village of Bylon. They are human-like, but these are not ordinary boys. Derrik Sparks is tall and strong for his age, a young man skilled with weapons, while the diminutive Tweaks is an inventor. “Don’t go into the woods . . .” Derrik has heard that parental warning all his life, but he is more man than boy now, and he is slow to accept the gravity of his father’s counsel when Willan Sparks tells the boys that there are demons living in the woods near Bylon. Derrik’s doubt is quickly erased when the pair ventures away from home to test Tweak’s latest invention. They soon feel the ground rumble and they see flying creatures headed for Bylon as smoke begins rising from their village. Racing back to help their families, they find they are too late. Their familes and nearly every other villager is gone. Their quest to find and free their families sets up encounters with strange beings from Bron Bahlmann’s vivid, creative mind. Bron fleshes out his characters with complex development and characterizations making it easy for the reader to become invested in these odd beings. I was particularly fond of the Ssaska the snake man, and the giants, whose language absolutely delighted me. Bron Bahlmann is not limited to creating creatures. There is good tension in this book, with new hazards, friends, foes and suspense on every page. The action is quick and satisfying. His prose is excellent and his descriptive passages vivid, drawing the reader in until you feel, hear and see this singular world. And did I mention that Bron is fifteen? But make no mistake. This is fiction any adult would be proud to place their name upon. I’m not a fantasy reader by nature, so it took a few chapters to hook me, but Bone Warriors reeled me in and captured my interest, and I marveled over it as I read. Bron's dialogue occasionally drifts into teen slang, pulling the reader out of Bron's bizarre fantasy world and back into reality. And having created such a powerful, depraved foe, I wanted a more dramatic resolution in the final battle. But these points do not diminish the pleasure of this novel, and at only fifteen, Bron has plenty of time to perfect his nearly-perfect craft. Bone Warriors is not merely a bludgeon and bleed tale. I was particularly amazed by Bron's ability to weave a strong moral story throughout the book, and the twist at the end was poignantly unexpected and tender, assuring parents that they can feel good about the message of this remarkable author's wonderful book. Distributed by Sweetwater Books, Bone Warriors is available on Amazon, and anywhere LDS books are sold. If you have children who love to write, buy them this book. It will entertain and inspire them. When Derrik discovers that the evil Necromancer was plotting with a mysterious man named Gabriel to destroy his homeland, he bands together with unlikely traveling companions to discover if the deadly plan is still in effect. Click video below to see how a mostly ordinary teenager became a published author. Remember when Eragon came out? And everyone was raving over what a wonderful book it was and that a 15-year-old was capable of writing such a great story? Personally, I didn't like it. I didn't think it was a wonderful book. The writing was weak. Good for a 15-year-old, perhaps, but not good enough to stand against other books in the genre. Now, I'm hearing the same things about Bone Warriors. But guess what? This one really is good. Derrik and Tweaks, the two main characters, were well developed. I loved Tweaks (almost cried at the end). I wasn't quite as fond of Derrik, but that's probably because he behaved more like a typical 15-year-old boy. They gain a couple of traveling companions on their journey to save their family. I liked Ssaska; I wish Clatterin had been a little better developed. I was amazed at the unique characterizations of the various groups of "people" Derrik and Tweaks encountered—the giants, the boars, the bird people, the alligator pirate, and more. Bahlmann gave them very distinct voices and personalities. I also thought the various fauna and flora in this world were ingenious and very clever. The storyline was complex and kept me interested. However, as a hero's journey, I felt I needed to see a little more change and growth in Derrik's character. I also thought we needed a little more foreshadowing of the eventual demise of the necromancer and his bone warriors. My biggest complaint about this book is the overuse of adjectives. It was sometimes too distracting. I'd recommend that on his next book, Bahlmann pull out half of them. And I do hope there is a next book. Bahlmann's book was good, regardless of his age. I recommend this book to teens who enjoy fantasy. Many adults will enjoy it, as well. I give Bone Warriors 4 stars. Erin chimes in: Overall, I liked this book but felt it needed a little tighter edit. (Quit with all those adjectives, already!) I hovered between 3 1/2 and 4 stars. I think that as his writing matures, we'll see some great things from Bron Bahlmann in the future. 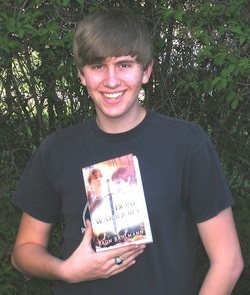 I received a happy surprise last week when reading fifteen-year-old author, Bron Bahlmann’s first novel, Bone Warriors. What an imagination this young man has. And what a fine grasp of cliffhangers, characterization, and teenage taste in books. The adventure drew me in, and I could visualize each scene as it unfolded. I also felt fear, amazement, and victory along with the characters. I won’t forget this one in a hurry—if ever! Well done, Bron. I hope to see many more of your books in the stores as you further develop your talent and skills. Bron says “I had a dream I couldn't forget, and after three years of writing, I complete Bone Warriors before I got to eighth grade." Bone Warriors by Bron Bahlmann is the first book I read for the Summer Reading Thing. I know Shirley, Bron's mother and a great writer, and she asked if I'd give Bron's book a review here on my blog. I was happy to do it because 1) I like to encourage young writers, and 2) I was interested to see what Bron—who started this book at age 11 and finished it at age 14—could come up with. I was very pleasantly surprised with the scope and complexity of this story. Derrik and Tweaks—best friends since children—are out in the fields when their village is destroyed and their parents and neighbors are taken hostage by the necromancer. The two boys set out on a long journey to rescue their families. Along the way, they meet Ssaska (a reptile man), Clatterin (a set of reanimated bones), a group of giants, "scales" and "furries" (man-like reptiles and mammals), boar-men, old men that turn into stone, and a whole host of other intriguing creatures—born from the imagination of Bron Bahlmann. The storyline follows the basic path of a traditional hero's journey, but with lots of fun twists and turns. Derrik and Tweaks grow and change, and become prepared to make the final battle when they stand against the necromancer and his army of bone warriors. I thought the writing was pretty good, with just a few exceptions (too many adjectives; a couple of story holes, like how did they know Clatterin was female?). The plot and dialogue were good and tight. Overall, I really liked the book and read it in two days. (It only took me that long because I was interrupted in my reading to tend my grandsons). If you like fantasy, I think you'll enjoy this book. I'm looking forward to seeing what this young man will come up with next. Saturday, May 30, 2009 by Cindy Beck "Write Up My Alley"
"Bone Warriors" is a highly imaginative, fantasy adventure novel about two teenage boys, Derrik and Tweaks, and the journey that defines their lives. Derrik and Tweaks are among the few survivors when a wicked Necromancer attacks their village. With their families taken hostage, Derrik is determined to find them, regardless of the cost. Tweaks, being the ever-loyal friend, goes along to help. The journey is fraught with peril, however. Along the way they meet a snake man, a giant cow, and a myriad of bizarre "people" and creatures that are determined to kill them. Fantasy readers will love the descriptions, the twists and turns to the plot, and the unique way in which Bron Bahlmann brings the story to its conclusion. In addition, Bahlmann's imaginative creatures will alternately evoke every emotion between love and hate, with humor thrown in between. My favorite character, Clatterin, plays an important role, but I'll not ruin the surprise by telling you how. You'll have to read it and see. "Bone Warriors" is an enjoyable, well-written novel, especially coming from a writer as young as Bahlmann. At fifteen, he's an author everyone should keep their eyes on. The first thing you need to know is that Bron was FIFTEEN when he published this book. FIFTEEN!!!!! Think about this, if he's fifteen now what is he going to be able to do when he's twenty????? The plot of this book is epic fantasy, two young boys righting a wrong, setting off on a grand adventure, rescuing people near and dear to them. What impressed me was the boy's ability to write. He has a descriptive ability that is beyond his age. His ability to write unique, believable, and likeable characters is inspiring. I especially liked Tweaks, the main character's best friend. He has a quirky personality that immediately made me smile. My recommendation to you is read this book and be impressed at this BOY'S ability. The story is a great adventure with likeable characters in a unique world. Best friends can be as different as night and day. Derrik is the son of the blacksmith; he is also much taller and muscular than his friend Tweaks. Tweaks is the short-sighted- always-busy inventor of the village. Looking at the two of them one might not expect such a tight friendship; however it is a strong and unfailing one. Tweaks takes Derrik to see his new invention. It is a bit out of the village, to help prevent a repeat of a previous invention gone bad. While explaining it to Derrik, the boys see something fly over toward the village and soon there is smoke coming from the direction of home. Both boys take off and come upon a nightmare. The village has been destroyed and people that they have known all their lives are missing, including their families. Derrik decides to go after his family but Tweaks is hesitant. As that first night comes Derrik is at home collecting anything that might be useful on his journey. As he works he takes a moment and looks and sees the house as his mother would. He stays to clean as much as he can before leaving in the morning. Tweaks catches up with Derrik after he is already in the forest and the boys set out to save their families and to take what adventure they stumble on. My children devoured the book in two days and mom got the left-overs. This is a book that is easy to read and the storyline is easy to follow. The vocabulary is simpler than many other fiction books for children but the author's vivid writing style reaches out and grabs the reader. Bron Bahlmann, the author, began writing this book at the age of eleven and had it published when he was fourteen. It will be interesting to see what he will come out with next. When I was asked to review Bron Bahlmann’s new book, Bone Warriers, It was still an ARC and hadn’t been released yet. Because of life changes and commitments, It kept being put back. I never knew what I was missing. Finally, I picked up the book and began to read. Two paragraphs into the first chapter, I became aware that Bron Bahlmann was no ordinary kid writer. I had to read his sentences out loud because of the mastery of his writing. Bron is a word weaver. He takes sentences and braids them into other sentences without the aid of a conjunction. And the words he uses conjure images in the mind, leaving the reader feeling like he/she has taken a journey. I like this book and I like reading it. The author has a long career ahead of him. I’m glad he writes fantasy because I would have to stop writing. My mediocre talent is no match for his. When I grow up I want to be like Bron. I want to be a word weaver. Bone Warriors is YA, but its a must read for everyone. You can find information about the book and Bron here. You can find the book at Amazon and fine bookstores everywhere.